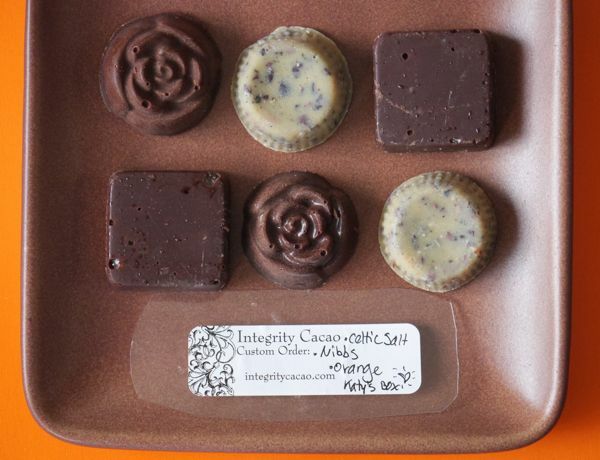 My sister gifted me some chocolates from a friend (Merissa) in Southern California, who happened to be founder and CEO of Integrity Cacao (Thousand Oaks). 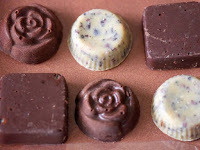 A small container held three different chocolate flavors: Orange Essence, Nibbs N Cream, and Celtic Sea Salt. 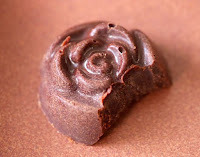 The pretty, Orange Essence rose-button shaped dark chocolates possessed a soft melt and a delicately fudgey soft middle. These chocolates were flavored with an authentic-tasting, lilting orange flavor (Orange Oil) with perhaps a touch of floral (rose?). The other two chocolates were: 1.) Nibbs N Cream (a creamy white chocolate with Tahitian vanilla bean and crunchy cacao nibs)—a healthy version of cookies and cream; and 2.) Celtic Sea Salt - dark chocolate squares with tiny chunks of grey Celtic Sea Salt, that the maker suggested pairing with wine and fruit. I really enjoyed these satisfying chocolates made with quality ingredients. Toned down sugar levels prevented them from being too sweet, which I appreciated.